Guyana is one of 193 member states of the United Nations. If one were to put the names of all the countries of the United Nations in one bag, like every other country, Guyana would have less than half of one per cent chance of being selected as a destination for foreign investment. While investment involves some element of chance, the choice of investment destination occurs under much more controlled circumstances and is based on a multiplicity of factors that could change the chance of selection dramatically. Countries with small economies do not attract as much investment as countries with large economies. As Guyana approaches the Guyexpo event of 2016, it will do so with the aim of starting the process of changing the fortunes of the country over the next 50 years. The article this week seeks to identify and discuss the several factors that enter the inward investment decision and their implications for Guyana, no doubt something on the mind of the sponsors of the imminent business exhibition. Next week, some attention will be paid to the upcoming Guyexpo event as part of the Jubilee celebrations. 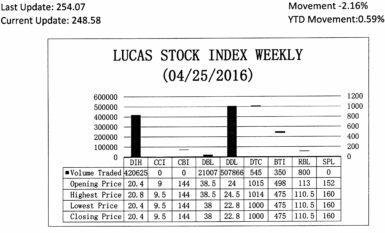 The Lucas Stock Index (LSI) declined 2.16 per cent during the fourth period of trading in April 2016. 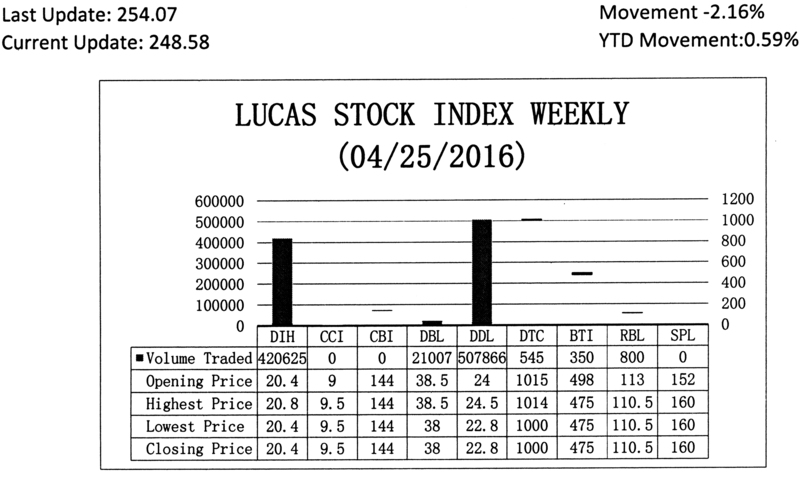 The stocks of six companies were traded with 951,193 shares changing hands. There were no Climbers and five Tumblers. The stocks of Demerara Bank Limited (DBL) fell 1.30 per cent on the sale of 21,007 shares. The stocks of Demerara Distillers Limited (DDL) fell 5.0 per cent on the sale of 507,666 shares. The stocks of Demerara Tobacco Company (DTC) fell 1.48 per cent on the sale of 545 shares. The stocks of Guyana Bank for Trade and Industry (BTI) fell 4.62 per cent on the sale of 350 shares and the stocks of Republic Bank Limited (RBL) fell 2.21 per cent on the sale of 800 shares. In the meanwhile, the stocks of Banks DIH (DIH) remained unchanged on the sale of 420,625 shares. The reference to investment always requires one to clarify the type of investment being discussed. A look at Guyana’s gross domestic product (GDP) tables reveals that investment could be undertaken by the private and public sectors. The public investment refers to spending in the domestic economy undertaken by the government, whereas private investment is spending done by private businesses, incorporated or unincorporated. A comparison of the two sources of investment spending reveals that the private sector is driving investment spending in the economy. The private sector spent more than twice the amount of money as the government on investment activities in 2014. The politics and the uncertainty that it engendered in 2015 no doubt led to the sharp decline in government spending in 2015. As a consequence, the ratio of private to public spending in 2015 was even higher in 2015, reaching as much as five times higher than it was in 2014. Part of the private investment contains the spending by foreign investors. This grouping of investors also has to be disaggregated into portfolio investors and foreign direct investors. This distinction matters because of the impact that each type of investor has on the production structure of a country and the expectations that the host country has of the investor. It should be kept in mind too that an investor is a person who defers consumption of one type of asset and converts it into another type of asset which is used to generate income. For example, a person who receives wages (cash) and decides not to spend it on consumer items like shoes, clothes and food but use it to buy and sell shoes, clothes and food is an investor. Similarly, a person who receives wages and decides not to spend it but uses it to buy shares in a company is also an investor. They are both looking for profits or returns on their investment. What is the difference between the two types of investors? One could be regarded as a direct investor. The other could be considered as a portfolio investor. However, a person, irrespective of the role that he or she plays, could be both a direct investor and a portfolio investor at the same time. What then is the difference between a foreign direct investor and a foreign portfolio investor? There are two definitions that help one to distinguish the foreign direct investor from the foreign portfolio investor. One is the Balance of Payments method of the IMF and the other is the Benchmark Definition of the Organization for Economic Cooperation and Development (OECD). The Balance-of-Payments method (BPM) defines foreign direct investment as “an investment made to acquire a lasting interest in enterprises operating outside of the economy of the investor”. The BPM also suggests that a person should own 10 per cent or more of the equity and voting power of the business. Taken together, there are at least three criteria that the investor has to satisfy to be deemed a foreign direct investor by IMF standards. In addition to the equity share, the investor must be able to exercise influence over the management of the enterprise and the investment must be intended to be of a long-term nature. While the long-term nature of the investment appears important to the IMF, it does not appear to be of significance to the Benchmark Definition used by the OECD. The OECD focuses more on the ownership size and influence of the investor rather than the lasting interest as in the case of the IMF. The OECD also accepts the 10 per cent measure of ownership in determining whether an investment qualifies as a foreign investment. However, it would accept a smaller ownership size if the investor can prove that he or she has significant influence over the management decisions of the enterprise. Sometimes, investors merely own their businesses while leaving the day-to-day operations to others. In both definitions, the designation becomes easier if the investor exercises control over the business. They must control the means of production and distribution. Under the definition of the IMF, a person who does not own 10 per cent or more of the investment and does not have a lasting interest in the business is a portfolio investor. For the OECD, a person who owns less than 10 per cent of the investment and has no control or influence is a portfolio investor. The aforementioned definitions contrast with the accounting requirements to be deemed a direct investor in a domestic economy. Accounting rules can complicate matters. For example, under Generally Accepted Accounting Principles (GAAP), persons, natural or artificial, who acquire more than 20 per cent of the shares of an entity, are considered direct investors. A person who owns 20 per cent or less of the shares of a publicly-traded private corporation is not regarded as a direct investor of that business. They are in effect equivalent to portfolio investors. Portfolio investors therefore do not exercise influence or control over a business or the investee. Therefore, one could think of portfolio investors as limited participants in a business who are short on influence and control and silent about its management. Assuming agreement on who qualifies to be deemed a foreign direct investor, once the initial investment takes place, consideration has to be given as to identifying and measuring the investment thereafter. There are at least two ways in which this is achieved. One is to consider if any additional equity is being added to the capital of the company. The other is to see if any of the profits was being reinvested in the company. Continuous reinvestment of profits points to the control that management has over the company. It also gives a good indication of the intention of a long-lasting relationship between investor and host country. Foreign investments are usually undertaken by multinational companies. They either set up brand new or “Greenfield” operations as in the case of Barama many years ago or they take over existing companies as was done by Guyana Telephone and Telegraph (GT&T) Company. Guyana has been able to attract foreign direct investment in all the sectors of the economy, namely agriculture, manufacturing, mining and services. The Bank of Guyana points out in its various annual reports that substantial amounts of foreign investment are directed to the telecommunications, mining and services sectors. Over the last 10 years, investment has grown by an annual average of two per cent. Countries seek to attract investment to create jobs and to expand the production structure. In addition to increasing finished-goods inventory they also seek to expand trade and exports. An important factor in attracting foreign investors is having natural resources that they want. Access to the resources gives the investor a chance to meet his or her investment goals, quite often that of maximizing profits. It is quite possible therefore that the ultimate interests of the investor and the host country might not always be the same.